← Day 9 July 3 – What a difference a day can make! The first two miles today were full of starts and stops. Just a few hundred meters into the run, I realized I hadn’t put sunscreen on, so we waved Pa Modou and Spider over and I protected my toubab skin. A kilometre later, the gauze I had only taped to my injured knee today came off. Kebba and I stopped again to get a clean gauze and a bandage to wrap the injured area and protect it from flies and dust. And before we could get too far down the road, I needed a nature break. Then, finally, we settled into a rhythm and the going was good. There had been no rain, so it was already hot and the dirt road was dry and dusty. The dust clung to my sweat and sunscreen and soon there were redish-brown rivulets running down my legs. Cars, taxis, tractors and large trucks driving by us belched black exhaust and swirled up clouds of dust that further covered us. I felt the grit of the sand between my teeth and behind my contact lenses. Meeting incredible people…every single step of the way! We stopped at a few villages to talk to people. Each of these conversations helps to create awareness of the Nova Scotia Gambia Association, its life-saving health education programs and about important health issues. It is also an opportunity to network in these communities and to pave the way future involvement in these places where NSGA may not have a presence to date. We came upon some people sitting in the shade of a tree and an ancient looking man with one arm came up to me to shake my hand. He asked in Mandinka what we were doing and the guys filled him in on our mission. I believe that by now I have heard just about every sound that Gambians make to express surprise and disbelief. This old man made one of these sounds and the toothpick he had been chewing on fell out of his mouth. I don’t believe he even noticed. He stared at me open-mouthed and to break his spell I laughed and slapped my right thigh saying: “Strong legs!” As if to verify, he then also slapped his hand on my leg and then gave my quad a couple of squeezes. Well behaved little Gambians getting a treat from the Love4Gambia 2012 super team. Later, while sipping some Gatorade in the shade, a group of children and their mothers came over and we handed out minties to the little ones and our empty water bottles to the women. People are always keen to take the empty 1.5 litre bottles off our hands, as they are used in the compounds to carry and store water and other liquids as well as small things. The kilometres kept ticking by and I was feeling good. As every day, I thanked my body for staying healthy and for putting up with the demands I’ve been placing on it these last few days. After 16 kilometers, Kebba was relieved by Spider who ran the remaining distance with me, which turned out to be nearly 17 kilometers today. When only about 6 kilometers remained, Pa Modou called me over to the car to tell me I had a phone call. I have on occasion talked to media on the phone during a run and often had calls from the NSGA’s country director and assistant director in Banjul to tell me how proud they were of the team and to encourage us. But this call was a surprise from Marc back home who wanted to send some love and encouragement all the way from Canada. I stood by the side of the road in the shade and talked to him for a while. It was great to hear his voice. Then I carried on for the last push. By now, the heat had become completely oppressive again and a hot wind was suffocating and draining every remaining ounce of energy out of me. Suddenly, the going was not so good anymore. We had also been faced with rolling hill after rolling hill today and my tired legs were feeling the effects. The time between beeps from my Garmin to alert me that another mile was covered seemed to get longer and longer. 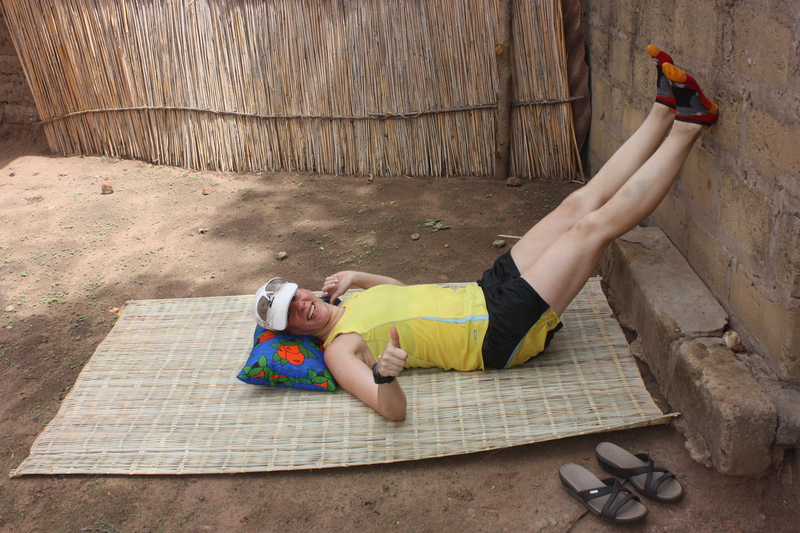 A well deserved rest after the run. Eventually, we reached the target for today and then carried on a little past this point to find a good shady spot to rest. A boy who had been herding a few donkeys past us came by and soon two others followed. They looked on as I stretched and changed out of my shoes. I asked them if they liked football. Silly question, as there isn’t one Gambian boy who isn’t football crazy. I then walked to the car and got out some football stickers and minties for them. One of the boys pulled one of the stickers off and put it on his shirt, a big smile spreading on his face. As every day at the end of our run, Pa Modou, our social media king who regularly posts Facebook updates on our progress, read us all the messages of support that had come in that day. This is always a great part of our day and we laugh, uhhh and ahhh, clap and occasionally tear up when hearing the kind words send to us by friends, family and even people I have never met in person. Thank you so much and keep them coming! We packed up and drove to our camp a little further down the road. This is where the dirt road ends and I’ll be back on pavement tomorrow. This is also the camp where I had met the three toubabs who were working on the road project when we drove up to Koina last week. The music was still blaring in the seating area under the roof and we ordered some cold colas. The camp is directly adjacent to an army base. A couple of soldiers were hanging around – one was getting his hair cut with clippers by a mate while another was polishing his heavy, black army boots. All of them were wearing fatigues matched with t-shirts or a bare chest and flip flops on their feet. And all of them looked like they could be in an ad for a gym. I could barely stay awake during lunch. The heat had completely zapped my energy and there was no rain cloud in the sky. After eating, I retired to my room. Sleep would not come, but I lay immobile on the bed for a few hours. The team is tired and we are all looking forward to the upcoming rest day on Friday. But before then, the South Bank Road demands another 30-some kilometres tomorrow. 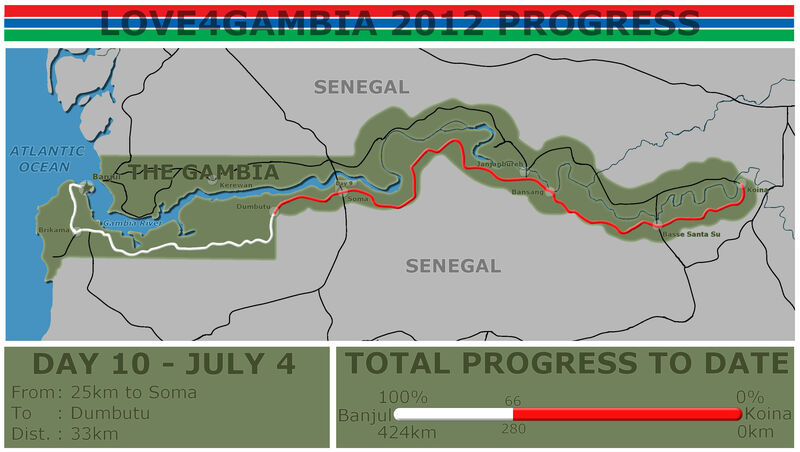 This entry was posted in Charity Run and tagged Africa, Gambia, NSGA, The Gambia. Bookmark the permalink. I’ve been following your quest as I did Erin’s last year with many feelings. I feel great wonderment, admiration even a little jealousy, until I read your blog that is, LoL. But most of all to you and Erin I feel gratitude, after reading Erin’s reports last year, and then meeting her, I was amazed. 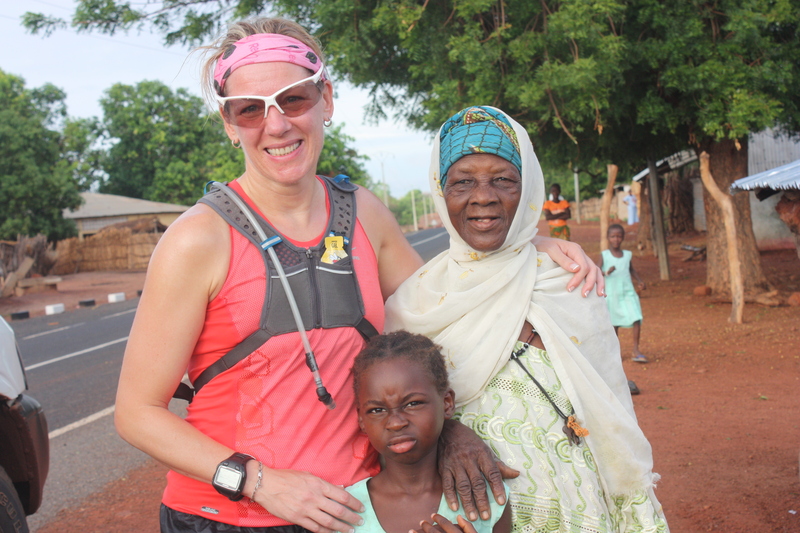 So much so, in fact, that in February I was moved to join the NSGambia team to run the 10K Race in Bluenose. I had never run anything before and you can ask Erin what kind of challenge it was for me. But I looked at what Erin and this group of dedicated people have accomplished and I was spurred onward. I kept training and raising money and bugged everyone I know and many I didn’t in my fund raising and was able to raise almost $2000.00. I am very proud of what I did in surviving that 10K run, but following you and the team in the conditions you are in humbles me. I know full well that the small contribution I made was very worthwhile and made a difference and all, but you doing this run helps to continue making what I did and what everyone else has done, big and small, more and more worthwhile with every stride forward. You reinforce all of the commitments that have been made before you. Because of that, all I can say is Thank You. And of course Keep on Keepin on!! You Rock!! Andrea and team, you amaze me everyday! Your push to Banjul is amazing. And you are leaving a beautiful legacy with the people that you meet along the road. I love your photos and love your reports and am sending you so much love. My wish for you today is rest. Isn’t it remarkable how the body can be so bone-tired yet no sleep comes? Andrea, give my congratulations to your legs for standing up to the daily grind and challenge with such strength. I’m sure that old man will remember your legs always 🙂 My boys, you’re the best team ever. I’m with you always. Andrea…I dedicated my hot yoga class to you today. As the sweat poured off my nose, elbows and knees, I thought of you and the endless heat you’re running through. The big difference for me was when my class was over, I exited the studio onto a breezy sidewalk. Wish I could send some of that cool air your way. But it sounds like you and your super team are doing a fantastic job of managing the heat and finding inspiration with every footstep. Hope you have some good music blaring out of the truck (I think Erin would suggest Akon??) and may your journey continue to amaze and inspire! You must have an endless supply of stickers! It is so cute to see those beautiful, happy and smiling kids appreciate even the smallest gesture! I can only imagine it gives you such a boost as you go. It will carry you every mile! You are making a new history for Love4Gambia. And it will not be forgotten. All the hard work is worth it, as I now that you know….every morning the first thing I do when I wake up is go to the computer and check the latest updates/the amazing photos/hoping inspirational thoughts will somehow channel from me across the Atlantic and over to you. You are all so special for doing this. Thank you all. enjoy your well-deserved rest! You are entering a beautiful part of The Gambia now! It sounds like the heat was an amazing force for you today. Here I am complaining about running in 21 degrees celcius! I do like the sun…. but sometimes running in the winter is easier :)! I will send cool thoughts to you today. I love the image of the elderly man hitting your rock hard legs! He must have been shocked. And I’m sure they look absolutely beautiful with the dust/sweat design. It is amazing how much we can push our minds and our bodies. Hope the run went well today and enjoy your rest on Friday. Thank you for your wonderful blogs. Cheers to you and your super team!!!! Andrea, I thought of you sometime during the night here when our AC was not working and we had hit record temps in Toronto of 36.6 Celcius during the day. Sleep would not come and while exhausted from the heat my mind drifted over the ocean to you…here I am tired after a day in an air conditioned office and there you are after running 33km in oppressive heat. Kind of made me feel small and unworthy of my complaints! You are doing an amazing thing, your journey will stay with you and those you touch along the way forever. You look amazing in the photos and those you are with have such huge smiles, the stickers, water bottles and your story obviously touch everyone you meet. Keep up the trek and positive outlook, you are heading for the finish line now! Much support and love from Canada!